After being asked to add an Islamic holiday to its official calendar, a Maryland school board instead decided to remove all religious references from the calendar. Not only was it a slap to Muslims but is actually the best solution to the problem of religious privilege in public. This entry was posted in Entanglement, Religious Intolerance and tagged church and state, holidays, public schools, religious privilege, war on Christmas on November 16, 2014 by Doug. 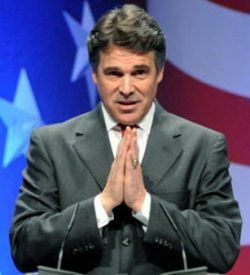 While signing a stupid law to ‘protect’ students and school officials’ ‘right’ to say ‘Merry Christmas’ and display other religious holiday claptrap on school grounds, Governor Rick Perry gave us proof he has absolutely no idea what ‘freedom of religion’ means. He has taken it upon himself to force religion into the public schools under the ruse that it is a right that needs protecting. Countless court rulings disagree with him. I really feel bad for the citizens of Texas who have to put up with such an ignorant leader. 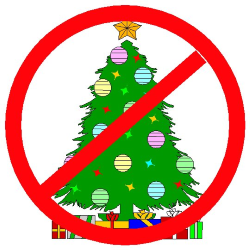 This entry was posted in Politics, Religious Intolerance and tagged 1st amendment, civil rights, freedom, holidays, Merry Christmas, public schools, religious bigotry, Rick Perry, Texas on June 14, 2013 by Doug. On Monday, a federal judge ruled against a group of Christian churches who had sued the City of Santa Monica California to reopen a park for Christmas displays. The 60 year old tradition was ended after a fight between atheists and Christians over displays last Christmas. The city took the action it thought necessary but the churches argued the city was violating its free speech rights. Like usual, the churches don’t know what freedom of speech really means. This entry was posted in Courts, Entanglement, Groups, Politics, Religious Intolerance and tagged 1st amendment, California, Chrismas display, church and state, free speech, freedom of conscience, holidays, public park, Santa Monica, vandalism on November 21, 2012 by Doug.